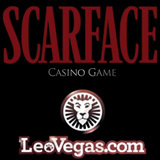 Mobile and online casino LeoVegas.com has just launched Scarface – The Casino Game with a TV commercial produced by PAM of Sweden that mixes scenes from the Scarface movie with the money, glamour and action depicted in the game. Tony Montana would have liked it. The game is based on the 1983 movie classic Scarface by Brian de Palma, featuring Al Pacino as Tony Montana. The game is produced by Net Entertainment and is provided under license from Universal.